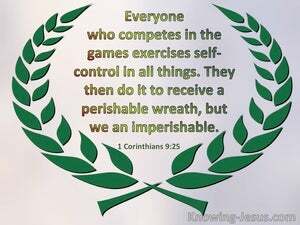 ﻿ 1 Corinthians 9:25 Everyone who competes in the games exercises self-control in all things They then do it to receive a perishable wreath, but we an imperishable. Now everyone who competes exercises self-control in everything. However, they do it to receive a perishable crown, but we an imperishable one. Everyone who enters an athletic contest practices self-control in everything. They do it to win a wreath that withers away, but we run to win a prize that never fades. And every man who strives for mastery exercises self-control in all things. Indeed therefore those men do it so that they might obtain a perishable crown, but we an imperishable. And everyone who [strenuously] competes in athletic events exercises self-control during training. Now they do this to receive a laurel wreath that withers, but we [do it to receive] a lasting crown. Every combatant in the public games is temperate in all things: they, indeed, that they may obtain a corruptible, but we, that we may obtain an incorruptible crown. And every man who takes part in the sports has self-control in all things. Now they do it to get a crown which is of this world, but we for an eternal crown. Everyone who competes in the games exercises self-control in all things. 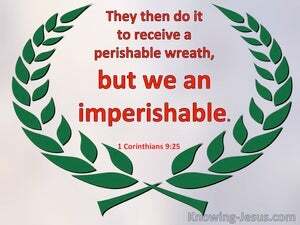 They do it to receive a perishable wreath, but we an imperishable. every one that strives for the mastery, is extremely temperate: now, they do it to obtain a corruptible crown, but we an incorruptible one. But every one that contends for a prize is temperate in all things: they then indeed that they may receive a corruptible crown, but we an incorruptible. But every one contesting is abstinent in all things, they indeed also that they may receive a corruptible crown, but we an incorruptible. Any man who enters an athletic contest goes into strict training, to win a wreath that will soon wither, but the one we compete for will never wither. And every one that contendeth, is temperate in all things: and they indeed, to obtain a corruptible crown, but we an incorruptible. And every man that strives for the mastery is temperate in all things. Now they do it to obtain a corruptible crown, but we, an incorruptible one. And every one contending for the prize, has self command in all things. These surely therefore that they might receive a corruptible crown; and we an incorruptible. And every man that strives for self control is temperate in all things. Now they do it to obtain a corruptible crown; but we an incorruptible. And everyone who competes exercises self-control in all [things]. Thus those [do so] in order that they may receive a perishable crown, but we an imperishable [one]. And everyone who strives for the mastery is temperate in all things. Then those truly that they may receive a corruptible crown, but we an incorruptible. Every man that proveth masteries abstaineth from all things. And they do it to obtain a corruptible crown: but we to obtain an uncorruptible crown. Every athlete practises self-restraint all round; but while they do it to win a fading wreath, we do it for an unfading. Every man who contends in the games continually trains himself by all manner of self-restraint. Now they do it to get a fading garland, but we, one that is unfading. Every man who strives in the games exercises self-control in all things. Now they do it to receive a corruptible crown, but we an incorruptible. And every one who contendeth in the games is temperate in all things; they, however, to obtain a perishable crown, but we, an imperishable. And every one that contends in the games is temperate in all things, they indeed to obtain a perishable crown, we an imperishable. But, every man who striveth in the games, in all things, useth self-control; - they, indeed, then, that a corruptible crown, they may receive; but, we, an incorruptible! And every one who contendeth [in the games] is temperate in all things: they indeed therefore do it that they may receive a corruptible crown, but we an incorruptible. Every athlete exercises self-restraint in everything; they, indeed, for a crown that fades, we for one that is unfading. But every competitor in an athletic contest practices abstemiousness in all directions. They indeed do this for the sake of securing a perishable wreath, but we for the sake of securing one that will not perish. Any man who enters an athletic contest practices rigid self-control in training, only to win a wreath that withers, but we are in to win a wreath that never withers. And every one who strives in the games exercises self restraint in all things; they, indeed, therefore, to receive a corruptible crown, but we an incorruptible. And every one that enters the lists is temperate in all things: they indeed do it that they may receive a corruptible crown, but we an incorruptible one.